A graph is a diagram that is meant to represent data and to portray a relationship. Analyzing graphs is useful for determining the general trend, relating the results of an experiment to the hypothesis and for formulating hypotheses for future experiments. When analyzing graphs, it is important to determine what the graph is displaying and why such information is pertinent to the experiment or to the context of the question. More than one type of graph can be used to represent a single set of data. Distinguish between the various types of graphs. The main types of graphs are picture graphs, bar graphs, line graphs and scatter plots. A picture graph uses pictures to represent values. Bar graphs use either vertical or horizontal bars to represent the values. 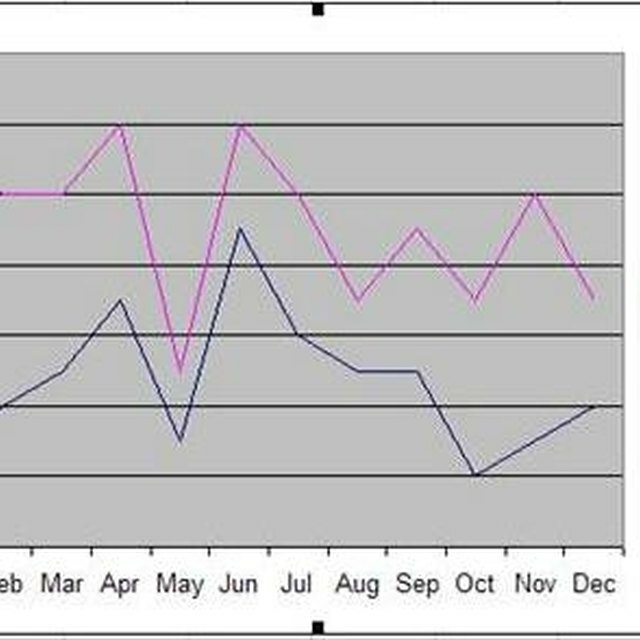 Line graphs use lines to represent the values. Scatter plots represent the data with points, and then a best-fit line is drawn through some of the points. Read the title and axes of the graphs in order to determine which type of data is being represented. The x-axis is the independent variable, or that which can be changed. The y-axis is the dependent variable, or that which depends on the independent variable. For example, on a graph of the height of rose plants during a period of six weeks, the x-axis would have the weeks, whereas the y-axis would have the height. Determine the general trend of the graph. In a picture graph, look for the line with the highest amount of pictures. For a bar graph, look for the highest bar. For a line graph and a scatter plot, look at the slope of the line. If the line is pointing to the upper right corner, then the slope is positive. If the line is pointing to the lower right corner, then the slope is negative. Look for data points that do not seem to fit the general trend. Not all sets of data display a perfect trend. Examine such points, and record them. If there is one bar, dot or part of the line that is out of place, then this may not be significant enough to affect the entire conclusion. Use the graph to make predictions about future sets of data. For example, if for each of the six weeks the plants increase in height by 2 centimeters, then you would continue this trend in the prediction. If the plant is 12 centimeters at week six, then a prediction at week seven would be 14 centimeters. Pesacreta, Mara. "How to Analyze Graphs." Sciencing, https://sciencing.com/analyze-graphs-8482849.html. 13 March 2018.